The company’s newest product, the Skreen Plus 4 provides a platform for all mobile devices on one screen. 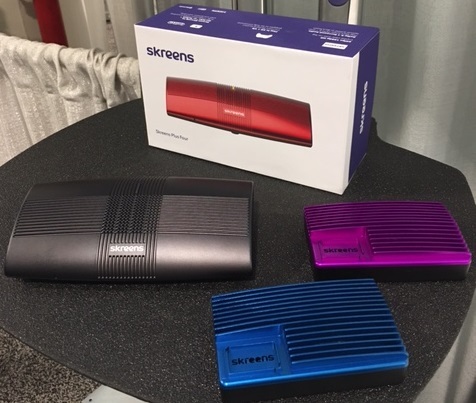 At CES 2016, it’s not easy to stand out from among the thousands of products and gadgets, but Skreens managed to offer an incredible demo to differentiate itself from the rest of the exhibitors. The company’s Skreen Plus 4 provides four HDMI input ports and one output to connect all devices to one screen. The story behind Skreens began with a successful Kickstarter campaign in which it raised more than $470,000 in funding for itself. The result was an awesome demonstration for a product that offers a platform for viewing feed from all your various devices on your television screen. It may sound like a bit of a chaotic mess but its design offers users the ability to organize the display windows to best suit them. In this way, Skreens can be used to toggle among all devices to give each full screen viewing as desired. This offers an incredible way to multitask all in one place. Think about it. You can watch a movie, play a game on a console, keep up with a stock or sports ticker and even view a Twitter feed all at the same time. As you want to give each screen priority, you can shuffle from one to the next, resizing windows and moving them around for your customized needs, or simply using pre-created layouts on screen. Among the components of the demo that was most impressive was the way in which the hubs could be worked into a daisy chain to allow for an even larger number of layout and feed choices. It works smoothly regardless of whether you have four, a dozen, sixteen or more. In fact, the founder and CEO of the company said that if there does happen to be a limit to the number of hubs that can be added, “we haven’t found it, yet.” Moreover, he explained that these feeds can all be run simultaneously without any deterioration in performance, unless it has to do with the WiFi performance in the location. That said, it would not be the result of the Skreen Plus 4 device, itself. Skreens will start shipping its Plus 4 devices in March, with a two-port option retailing for $249, or a four-port option retailing for $449.